Who doesn't like to Monkey around just a little bit?! Monkeys and jungle themes are especially popular for kids' birthday parties and vacation bible school. 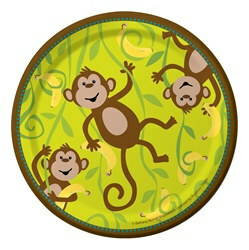 Now you can decorate with this adorably cute Monkeyin' Around tableware. You have quite a selection to choose from! Try the Monkeyin' Around Hot/Cold Cups, the Monkeyin' Around Dessert Plates, the Monkeyin' Around Monkey Shaped Plates, the Monkeyin' Around Lunch Plates, the Monkeyin' Around Beverage Napkins, the Monkeyin' Around Happy Birthday Lunch Napkins, and a Monkeyin' Around Plastic Tablecover. Be sure to also check out some of our solid green tableware. Our solid green tablecovers and green cutlery are great for bringing a little bit of the jungle to your party! The possibilities are only limited by your imagination! So next time you're in need of some Monkey themed party tableware party with us! We're PartyCheap.com and we know how to party! Does your kiddo love to monkey around the house? Well if so we have the perfect tableware to add to their jungle or monkey theme party! 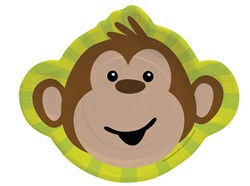 We have a Monkeyin' Around tableware set that is disposable paper, so easy clean up, and adorable! Our Monkeyin' Around tableware has matching plates, cups and napkins in the set so each table setting can all coordinate with monkeys! Make your little monkey happy by giving them the cutest monkey theme party! Make sure everything is complete! Grab a yellow or green table cover and get one of our jungle theme centerpieces like our Monkey Foil Centerpiece, to tie in the table decor. Make sure to get a look at all of our jungle theme decorations to see what else would make your little monkey happy at their party! We have anything and everything you'll need to make this a truly memorable birthday party or other special event. No matter what kind of tableware you are in need of we've got you covered right here! So party with us! We're PartyCheap.com and we know how to party!